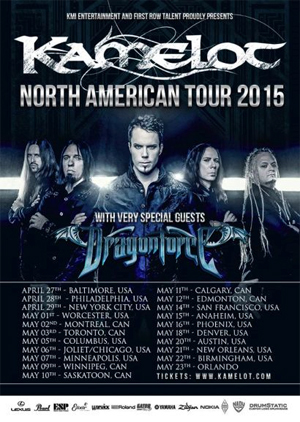 KAMELOT recently checked about their tour plans for 2015: "We are pleased to announce we are returning to North America in 2015, in support of the new album due for release in March 2015. The band is busy in the studio now and cannot wait to return to the USA and Canada for their biggest North American stage setup ever. Special guests on this tour will be DRAGONFORCE from the UK. This is will be a Symphonic Power Metal Extravaganza!"